My husband and I spent a 3-day weekend in Puerto Vallarta this last week and we completely fell in love with this romantic little beach town. Puerto Vallarta is located on the Pacific side of Mexico, about half way between Cabo San Lucas and Acapulco and was only a 2 hour flight from Dallas, Texas. This was our first visit to PV so we decided to keep it short and plan a longer return visit if we loved it, which we did! We stayed in an incredible hotel in the Zona Romantica, which is the “old quarter” of PV and has tons of restaurants, hotels and is full of cobble-stoned charm. I’ll post separately about our hotel because it was so special and has lots of history (hint: it was previously owned by a very famous actor and actress back in the 1960’s and has been turned into a luxury boutique hotel). So, what is there to do and eat in Puerto Vallarta? Well, first there are the main beaches in town. Playa los Muertos was about a 5 minute walk from our hotel. Along its beach front are restaurant after restaurant with amazing ocean views and great people watching along the boardwalk. We came down here twice in two days for lunch and loved strolling around and then sitting for margaritas, tacos and enjoying the view. Even though there are many condos and hotels lining the beach, it really wasn’t overly crowded. We also found that PV has swimmable beaches (unlike most of Cabo San Lucas where the waves are too rough or its rocky) and the water is a lovely blue/green (unlike Ixtapa where the water was a nasty brown). Of course, there are also plenty of shops but like many Mexico resort towns, it was lots of t-shirts, trinkets, “pharmacies” and tequila shops. Many of the beach restaurants are also “clubs” where you can pay for two chaise loungers and umbrella in the sand and then have beach side service from the restaurant all day for food and drinks and be able to use the restaurant bathroom. We saw lots of people doing this and agreed it would be a fun way to spend the afternoon on the beach if you weren’t at a beachfront hotel or condo, which we were not. Another fun thing to do if you have limited time and are staying in the old town, is to explore the Zona Romantica, which has so much character. All of the streets are cobblestones and most of the buildings date back to pre-1950 or even earlier. There is an old church in the middle of town, an open air market, many food vendors and tons of bars. You really feel like you have stepped back in time, which is a very different vibe from Cancun or Cabo, which are very modern and lack the old-school fishing village vibe that I loved here. Also, it was quite busy in this area with police officers around so we felt very, very safe here walking around on our own. We were told that this area is very safe for tourists and they have little to no crime other than pickpockets and the usual petty stuff. 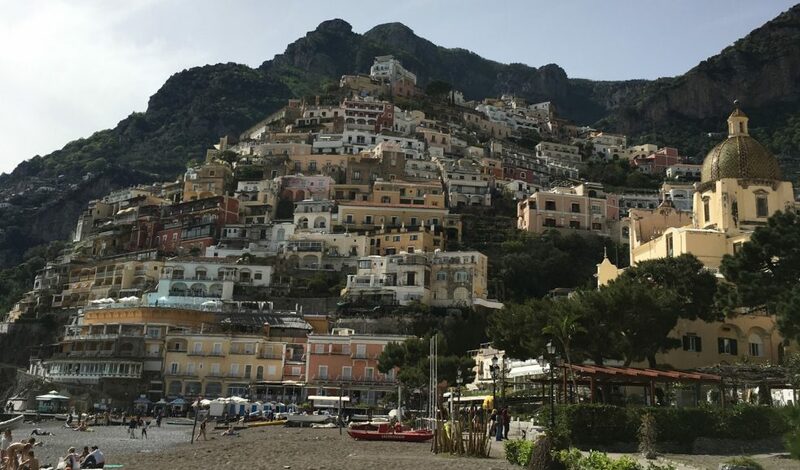 One piece of advice – wear flat sandals or decent walking shoes because the uneven cobblestones are murder on your feet and ankles and this area is also very hilly and requires lots of climbing and steps. My calves were so sore after Day #1! Steep cobblestone steps heading back up towards our hotel – it was a climb! The boardwalk area downtown is called The Malecon and is a nice paved area along the beachfront with art work and statutes. We enjoyed two great restaurants down here for lunch each day (lingering over margaritas was a great way to spend the day doing nothing). The Blue Shrimp is where we ate the first day and they make a strong margarita – they actually bring out the bottle of tequila and pour it into your glass until you say when! Very peligroso! We thoroughly enjoyed some massive coconut shrimp, guacamole and some fish tacos here on Day #2. Service was friendly and everyone spoke English but the pace is a little slower, which we preferred. We thought this was a very interesting marketing concept and we did not accept the dare. The next day we went a little further down the Boardwalk and ate at the very first beachfront restaurant to open on Playa los Muertos back in the 1950’s, called La Palapa. It was a little more upscale than the Blue Shrimp and played very chill music and had pictures of all the old celebrities that have come here over the years. It was definitely an older crowd here but, hey, we’re not exactly spring chickens anymore either. We again enjoyed fish tacos here and a ceviche sampler that was excellent. Of course, you can’t eat every meal on the beach so definitely head up into the hills for restaurants with a view! Our first night, we had dinner at The Iguana Restaurant, which was located inside our hotel. This is an upscale restaurant and they have a dress code (no shorts, no flip flops, no bathing suits) and they also have the best mariachi band playing every night – it was such a romantic atmosphere. Of course, the sunset views were amazing and the food was lovely. The food was still Mexican in style with a few French twists, including pepper steaks, stuffed squash blossoms and lobster tacos. We tried the squash blossoms and I had an incredible sea bass dish. Finally! I got a great picture of my husband and he’s smiling!!! So, the location is the former home of a famous actress…does this picture give it away? Dinner our last night was at our hotel’s sister restaurant and hotel, La Cappella. As the name may suggest, the food was Italian in style, which was great because even we were getting a little tired of margaritas and tacos by Day #3. This hotel was just a little further up the hill and around the corner from where we stayed. As you can see, it also had a gorgeous view from the open air restaurant and overlooked the historic church. I kept it simple this evening and went with a fairly basic prosciutto pizza but the food was well done. Instead of mariachis, they had a lovely couple playing violin music that we thoroughly enjoyed (granted, I was a bit tipsy by this time but they were quite good). So, overall, I think it’s safe to say that Puerto Vallarta won me and Steve over in just 3 short days. We really enjoyed the charm, the beaches and the wonderful restaurants here way more than we expected. Maybe I just had low expectations because of other trips to Mexico. We have previously been to Cabo, Cancun, Playa del Carmen and Ixtapa and we agreed that Puerto Vallarta is our favorite. Now, we also agreed that while we loved our hotel up in the hills, it would be nice to stay at a beach resort a little further outside of town for a few days as well. We are already discussing a return trip where we stay 3 nights in the Old Town again at the same hotel and then move out to Punta Mita for another 3 or 4 nights at the St. Regis or Four Seasons beach resort. Between the super easy flight from Dallas (and the PV airport is very modern and air conditioned) and the amazing food and beaches, PV was a huge hit! I’ll post about our amazing hotel next! Thanks! It was lovely. Visiting Santa Barbara, CA in March! Wow! You have some beautiful places to visit. We fly out to Atlanta Geogia then coach to Memphis, Nashville, Savannah, New Orleans and other places in April. So excited. No idea what to pack as never been to this part of the world. Will be wet and cold usually here in the NW of the UK.